Both variants of the Samsung Galaxy Watch support the same LTE bands, which means that the larger unit will also be compatible with the LTE networks of all four major stateside carriers. Both models also support Wi-Fi (802.11b, 802.11g, 802.11n). 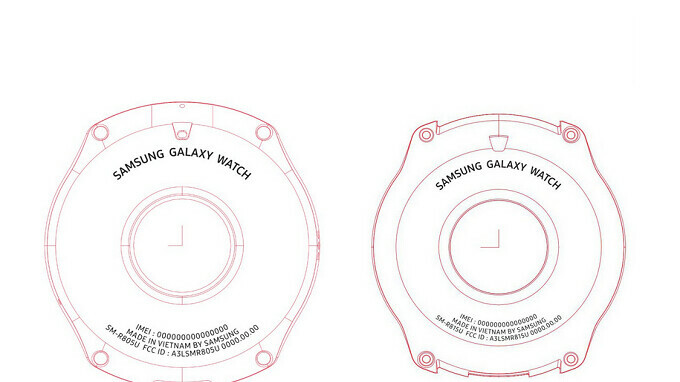 The larger version of the Samsung Galaxy Watch (SM-R805) appears to sport a different case than the smaller unit (SM-R815). Check out the image at the top of this article; the larger model is on the left. We expect the connected timepieces to be powered by Tizen, and should be unveiled on August 9th alongside the Samsung Galaxy Note 9. The release date for both eagerly-awaited products will reportedly be August 24th. 48mm case with 1.3" screen translates into an extremely fat bezel; my TAG Heuer Connected 45 is 45mm and has a 1.39" screen. And I think this is the correct bezel balance. My Huawei Watch 2 with its 45mm case and the 1.2" is already too bezelly and these numbers imply that the Galaxy Watch will have a huge size with quite small screens. I don't think that smartwatches need to be bezelless like smartphones, because they are primarily watches, but these numbers are worrying.